Tear Up That To-Do List and Have a Scattered Day! Happy Monday everyone! I hope you all are having a great start to your week. Me, after I get this post sent out to all of you, I’m tearing up my to-do list for the day and declaring today a Scattered Day! What is a Scattered Day? It’s my coping mechanism for when I just can’t seem to focus on any one thing. Do you ever have days when you’ve got to do one thing, but as you’re doing it you remember something (or things) you want or need to do as well? And then you find yourself thinking about that/them and unable to really focus on what you’re doing, so it takes a hundred times longer to complete, if it even gets completed? Well, that happens to me … A-L-O-T! Usually, I can just jot the idea down and keep on going. But sometimes it gets to be a little much. Some days I can’t focus on getting one thing done long enough to get it done. 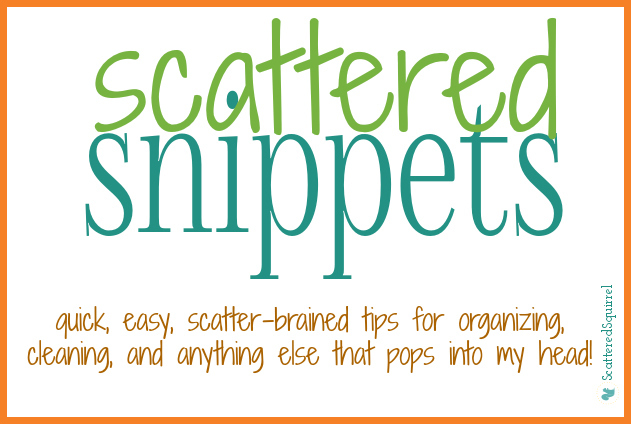 Whether it’s an idea for a blog post, a chore that needs to be done, an organizing project I want to tackle…. ideas skitter through my brain and before I know it, what should have been a half hour job of cleaning the living room has taken me most of the day, and I’m still not really done. This is ok when it only happens now and then, but I seem to go through cycles. As I near the end of the cycle these days happen more and more, and I’m left feeling frustrated that I didn’t really accomplish anything but it feels like I spent all day working away. I’m learning to pick up the warning signs early. Not as many items crossed off the to do list. Daily clutter taking over more and more of the home. Dinner dishes soaking in the sink when I go to make coffee in the morning. Mount Wash-More and Mount Put-Away-More have grown to equal sizes and the closets are bare but the baskets and hampers are full. My office looks like a tornado went through it, and I’ve broken my own rule of nothing but my stuff being allow on my desk. And … well I guess you get the point. When life gets like this for me, I embrace my scatter-brained nature and give myself a Scattered Day. A whole day in which I don’t worry about finishing anything, I just let myself flit from one thing to the next. Instead of fighting the distractions, I run with them. And you know what? The benefits are amazing! I wake up the next day able to focus more clearly. Often times I wake up to a nicely clean home, and most of my cleaning for the week is done. A Scattered Day isn’t about what gets finished, it is simply about doing! Doing what pops into your head! Instead of feeling like you get nothing done, you know you got stuff done, even if you can’t see the results. It’s about taking back control, by letting go of that control. It’s about letting go of our own preconceived standards and notions and just allowing ourselves room to breathe. So, if you’re feeling scattered, or like you have to much to do and you don’t know where to start, give yourself permission to have a Scattered Day. The rules are simple. Those are my rules for a Scattered Day, but you can make up your own. Maybe you can’t give yourself a whole day? Give your self an hour then, to just ‘do’ something. 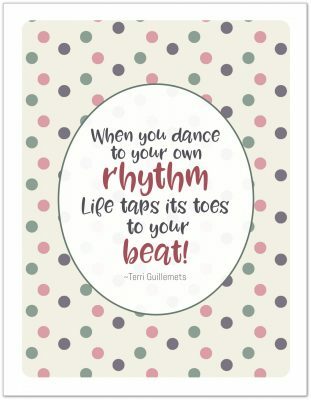 Or take the morning, or afternoon, or evening…. the point is, sometimes when we’re overwhelmed by the To-Do’s list we need to just forget about the TO and the list parts and just worry about DO! Maybe you don’t have times like these. I know many of my friends don’t. But if you do have times like these, please know you’re not alone. I know what it’s like to spend the whole day cleaning and tidying only to look around and not really see a difference. I know what it’s like to know you have a million and one things you need to do, and yet not get a single one finished for some strange, unfathomable reason. I know what it’s like to wake up feeling productive and ready to take on the world and to go to bed that night feeling like you failed in so many ways. But you know what? It’s not a failure! For some of us, it’s just the way we are. Life gets messy, life just happens, and sometimes we need to give ourselves permission to not worry about all the excess stuff, and just focus on embracing US. 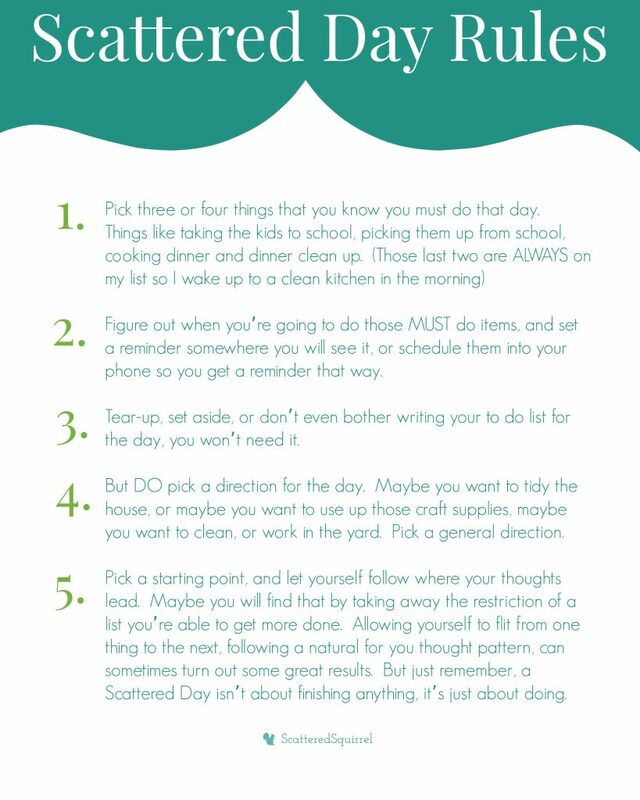 So if you’re feeling overwhelmed by your to do list, or just unable to focus long enough to get stuff done, pick a day, tear up that to-do list and declare it a Scattered Day for you. Please note: A Scattered Day is not an every day thing. It’s not a substitute for a daily routine that works for you. It is simply a tool to take a step back, give yourself a little breathing room, and to regroup and recharge. It is a way to take back control. And now, dear friends, I’m off to turn on some tunes and take back my house! My direction is to simply put thing where they belong. I’ll worry about the cleaning if it pops into my head, lol if it doesn’t there is always tomorrow. Never forget that! What about you? Do you ever have times like these? Do you have a tool or coping mechanism for when life happens and you need a break without being able to take a real break? I am so glad I am not alone. I call those “Putter days” because I just end up puttering through the house. I tend to brainstorm on those days so I like to take a pad of paper with me to write anything down that comes to mind. That’s a great way to tackle days like that Cherie. I love brainstorming, it seems to really help me clear my head. Came across your post when I really needed it! I thought I was the only one with “cycles” Your words really helped me!